2008 brought China's first Olympic Games in the country's showcase capital city, Beijing. I had my very own dreams to reach Beijing, China and like those athletes I did my own work to make it to the finish line. Going for gold I used my third weekend in Beijing to experience the showpieces of Beijing's Olympic glory. Will I be in Beijing for the 2022 Winter Olympics? Maybe B? I was ready for my first full sightseeing day in Beijing from my new home in Shunyi, Suburban Beijing! Scouting a MoBike I zipped down to China International Exhibiton Center Subway Station on Line 15, I'm lucky enough to live on the same line as the Olympic Green, it was a no-brainer! It was great not having to interchange lines because in Beijing that takes some serious time! As I surfaced from the underground shopping centre that was connected to the Subway Station I saw the famous five Olympic rings in perfect view. 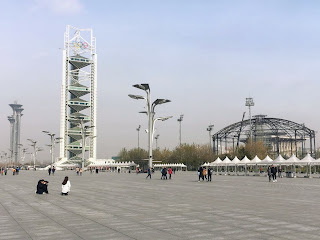 Why was Beijing's Olympic Green my first real day out? 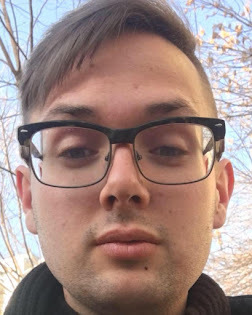 It was definitely that Line 15 direct connection that swayed that decision for sure! The openness of what looked like the 'Olympic mile' was staggering, the pollution decided to take a day off so another rare day of blue skies gracing that Saturday. Biking some more because I wasn't going to waste an Olympic minute! No! In front of me I could see a towering structure that resembled three flowers, rotating on the top were the five famous Olympic rings for all to see. I marvelled at the pristine environment, no litter could be seen during that manicured showcase area. 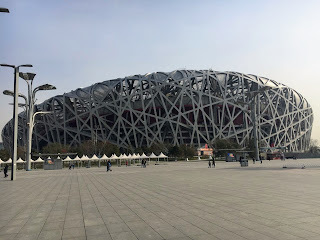 I only ever got the chance to see the Beijing 2008 Olympic Games on television in snippets during the annual family holiday, it was truly amazing to be in that triumphant location in real life. I noticed a development next to the Bird's Nest Stadium, it looked like it could be part of the venues for Beijing upcoming 2022 Winter Olympic Games? 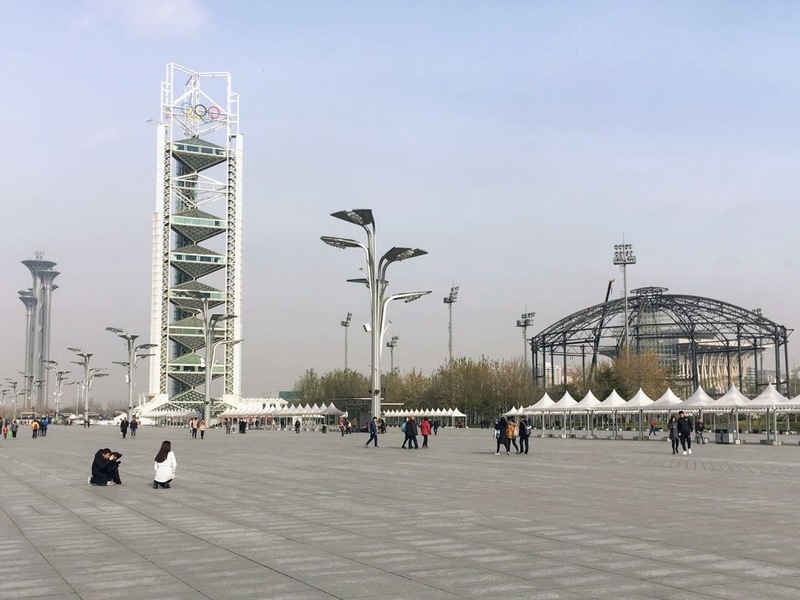 I wasn't surprised that Beijing bagged the second Chinese Olympic Games, China made a strong bid and has some grand plans for the main venues in Zhangjiakou. New high speed rail lines are currently being built from Beijing North Railway Station for the games with a dedicated station at the Badaling Great Wall of China. If I'm still in town during the games I wouldn't mind grabbing a ticket! 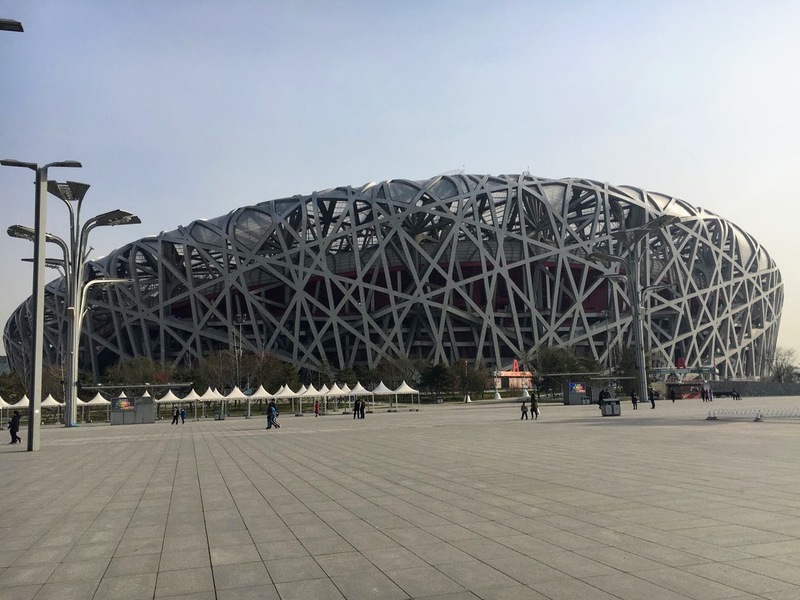 The main attraction had to be the Bird's Nest Stadium, the home to the main events during 2008's Summer Olympic and Paralympic games. Entering the Olympic 'mile' once more I caught the first glimpse of that gargantuan steel structure, it honestly looked like a giant birds nest! Another sense of national pride could be felt within that Olympic environment, I heard a Chinese song with the title '我爱你北京!' For those who can't read or understand the smallest bit of Chinese that song translates into English to 'I love you Beijing!' When I visited London's Olympic area in Stratford, East London I certainly didn't here any songs that went like 'I love you London!' China has that central core value to love ones country, known as '爱国' which is one of the twelve party core values, one which I agree with because I love saying that I'm from England but China takes that national pride for their country higher! Yes! Making a splash during its time as the main facility for the diving and swimming events during the 2008 Summer Olympic Games the Beijing National Aquatics Centre served with all of its cubic glory. I had no desire to look inside at the exhibits because the view of the remarkable water like sports facility pleased me visually nonetheless. I could have gone into both the Bird's Nest Stadium and Aquatics Centre for less than 200 Yuan but walking around the area was completely free, I'll save my admission fee for the Mutianyu Pass at the Great Wall of China! Tour groups congregated outside the huge former Olympic Stadium for photos and for a rather loud commentary from their tour guide, I always try and be my own tour guide because I can't abide by following someone else's rule or being in a group, Tibet was the only exception! I had seen photos of the Bird's Nest Stadium lit up at night with all of its blueness but I wasn't so ready to see that, Beijing's nightlife better wait for pay day! Scanning another MoBike QR Code, I peddled from the Olympic Stadium and Aquatics Centre towards the Olympic Forest Park to catch a sense of calm because Beijing can sometimes serve a little too much concrete and steel! Boasting its own Subway Station on Line 8 makes it easy for Beijingers and fellow foreigners, I wasn't in need of transport though. Astonishingly all 680 hectares of the Olympic Forest Park are man-made, constructed carefully with consideration of the Olympic venues in close proximity. 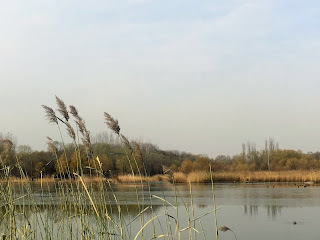 I took a small stroll around the lake and towards the Gingko trees but I wasn't trekking through the hills for nobody! Families mostly made use of the scenic oasis of the forest park and the health conscious jogged and powered walked around the park but that wasn't my hype whatsoever! 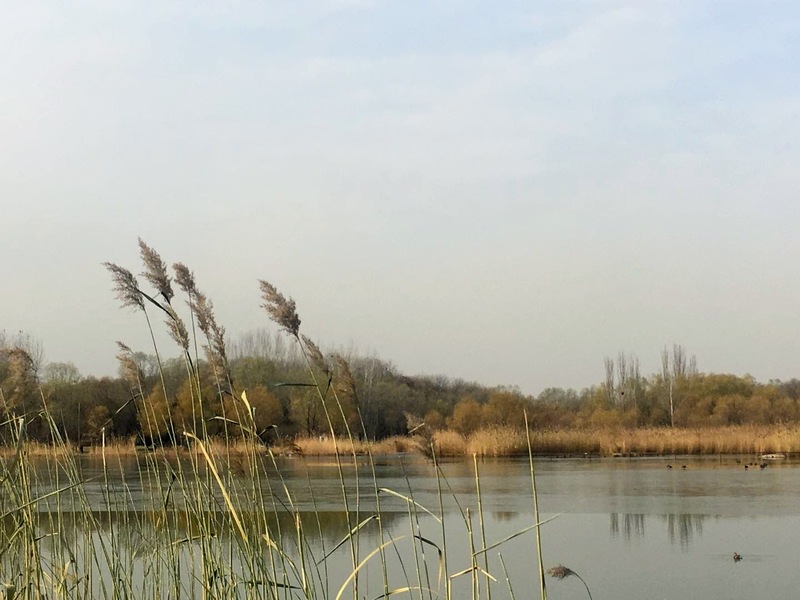 Beijing's blue skies continued to grace that Saturday with a smattering of haze, I didn't pay too much attention to that. BJ park-life!